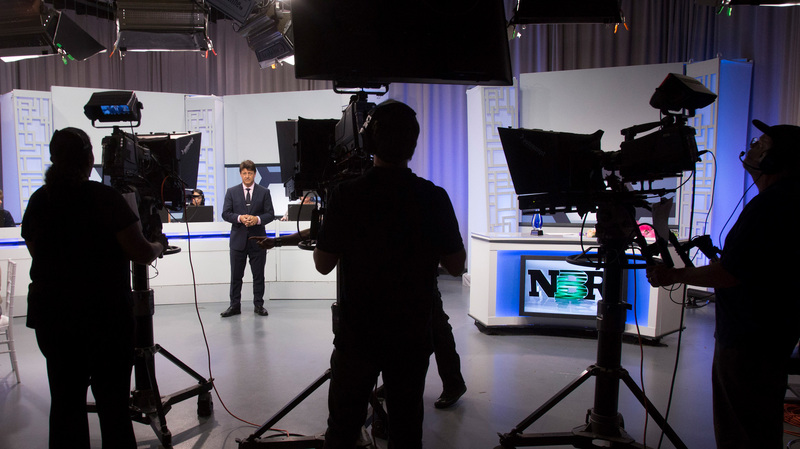 Go behind the scenes at Detroit Public Television by joining us for a fun and informative station tour. You’ll get a look at our studio space, master & studio controls, edit suites, HD production truck and possibly sit in on a show taping. We are not currently accepting tour requests at this time. Free tours are conducted on Thursdays from 10 AM to 12 PM and last approximately 45 minutes. Reservations are required at least two weeks in advance and it's best to provide a few date choices on the request form. Groups of up to 12 guests can be accommodated comfortably at one time. Larger groups may be split and require additional guides; please be sure to indicate group size on request form. Please know that we will try to accommodate everyone, but submitting a tour request does not guarantee your tour date. A station representative will be in touch to confirm details. While we welcome Girl Scouts, Boy Scouts, and many school groups and organizations, we require that all of our guests be 10 years of age or older. Guests younger than 18 years of age must be accompanied by an adult or chaperone. Tour guides are staff members or trained volunteers who will guide you around our Riley Broadcast Center in Wixom. Guides may also explain the management, operations, training, and fundraising aspects of the station. We understand that plans change and cancellations are appreciated at least 24 hours prior to your scheduled reservation. The following days are currently unavailable for tours: June 14, June 21, July 5, August 16, November 22, December 20, December 27, 2018 and January 3, 2019.